Somona County is rich in wine and history. 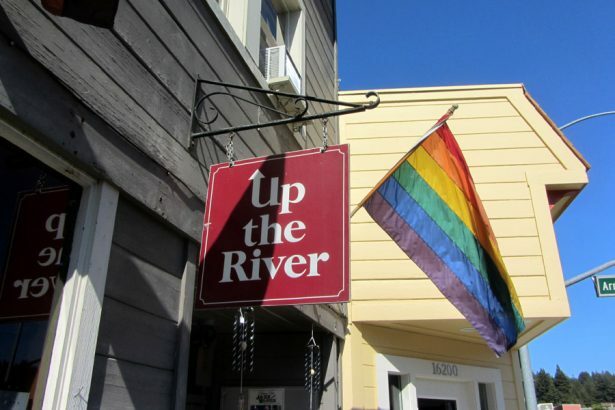 Wedged between sundrenched hills and the rugged Pacific coast, Russian River is one of the most established holiday destinations for Amercian gay holidaymakers. Those who leave San Francisco to the north via the famous Golden Gate Bridge, turn their backs on the lively metropolis and find themselves in gently hilly Sonoma County after an hour’s drive. This corner of the world might not be quite as famous as the neighbouring Napa Valley, but is a paradise for wine lovers no less. It is also ideal for those who want to become one or those who want to spend a few days in diverse countryside between vineyards, dense forests and the rugged coast of the Pacific Ocean. The valleys where Chardonnay, Cabernet Sauvignon and Pinot Noir, but also Merlot and Zinfandl, are cultivated are called Dry Creek, Alexander, Sonoma and Russian River. 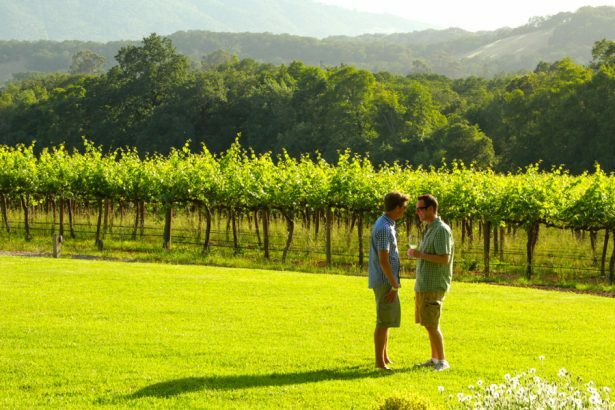 Small villages like Santa Rosa, Sonoma, Healdsburg or Sebastopol are sprinkled in this area, that are ideal starting points to visits to countless wineries and their “tasting rooms”. Even those who are not notably familiar with wine will get their money’s worth here. While some wine makers such as the Benzinger family offer guided tours through their vineyards and cellars and inform visitors about wine production, other estates are particularly worthwhile for their unusual architecture. The Francis Ford Coppola Winery, e.g. is housed in a mansion similar to a castle, where the party gets going at the pool, especially on Sundays. Beside one of the best restaurants of the region, there is a small exhibition with props from Coppola’s films as well as his Oscars. The visionary film-maker was also very individualistic regarding viniculture, presentation and marketing. He calls his best wine Archimedes, he has dedicated the sparkling wine to his daughter and named it “Sofia”. At Ledson Winery there is a seemingly old castle at the heart of the vineyards, where the Adams Family could easily reside. When it comes to pomp and show-off, this tasting room is hard to beat, but you are better off tasting wine elsewhere. J Vineyards is a chic and modern specialist for champagne that can be tasted in the famous “Bubble Room”. True wine connoisseurs, on the other hand, have a choice of small but fine vineyards who make it clear that Californian wines can compete with premium wines from South Africa, Australia or New Zealand. Gary Saperstein and Mark Vogler with their company Out in the Vineyards focus on gay wine lovers. 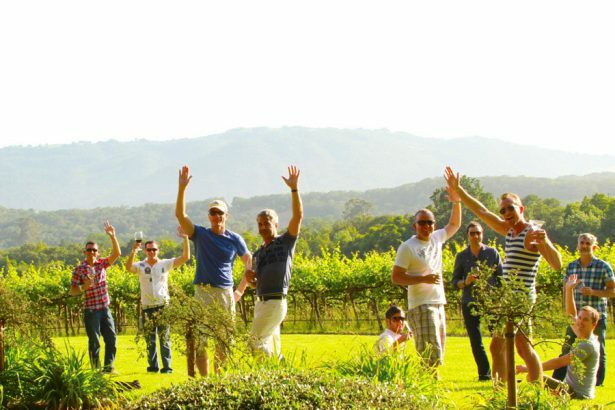 The two put together individual tours depending on their customers’ preferences and also organise events such as the Gay Wine Weekend in June. If you head west from Sonoma Valley, you will soon reach the area of the Russian River. There are no vineyards here. The road to Guernville, the main town on the Russian River, leads through dense green forests instead that hardly let a ray of sunlight reach the ground. There is an scent of wood flowers and wood in the air in this valley. The Redwood, a variety of sequioa, is omnipresent here.The name of the river is due to the almost forgotten Russian colonial history of California. In 1811, a Russian colony was founded near the estuaries in order to supply Russian America (part of it are today’s state of Alaska) with food and pelts. The area became a popular destination for summer visitors at the beginning of the 20th century thanks to a railway connection that had initially been built for the transport of wood. 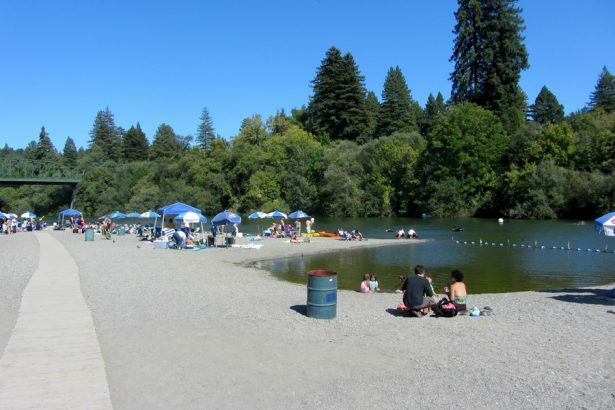 Offering dance halls, bars and nightclubs and small beaches along the river, the Russian River was extremely popular with young people in the 1930s and 1940s. 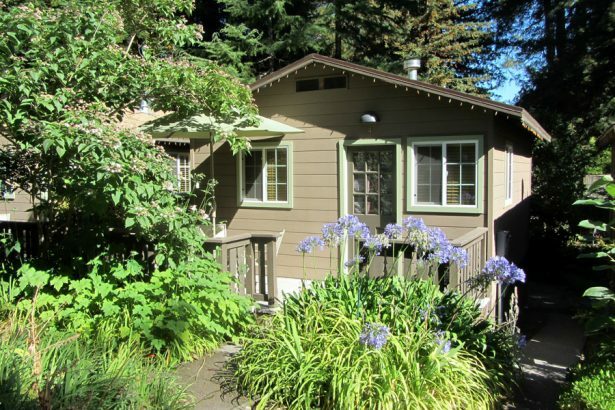 After World War II, holidays in simple wooden cabins were out of fashion, only the gay scene from San Francisco helped the Russian River to a renaissance again in the 1970s. Gay resorts emerged like mushrooms after a warm rain in Guernville – it was wild times. At the height of the AIDS crisis of the 1980s, many HIV-positive people withdrew into the seclusion of nature at low rents to spend the last months of their lives here with friends. The expression ” so beautiful you could die for it” became a tragic reality here. The bond of the gay scene with this idyllic spot of Earth is particularly strong for the shared history. It is completely understandable how upset people were when the most famous / infamous gay resort RRR was closed in summer 2011. 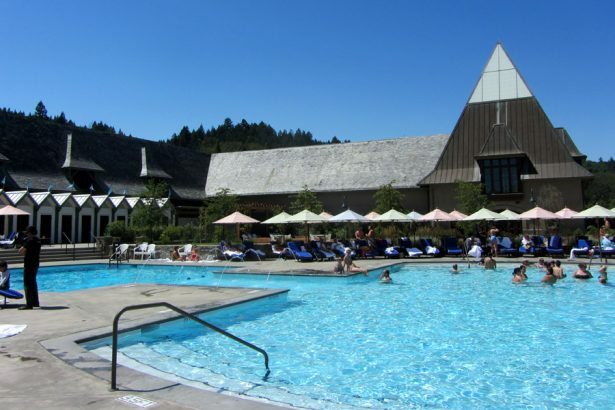 The resort with pool, bar and restaurant was the heart of gay Russian River. Everybody got excited when the resort re-opened at the end of 2011 under the new name The R3 Hotel. 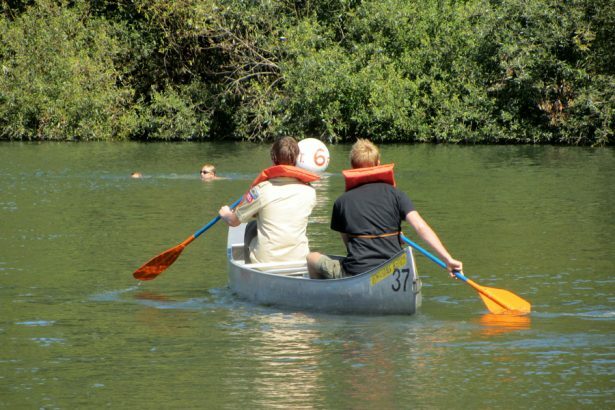 The gay summer pleasures on the Russian River are available again. The famous Lazy Bear Weekend in August especially attracts a good thousand guys to the otherwise very tranquil place. There are plenty of pastimes: kayaking on the river, hiking through the majestic redwoods of the Armstrong State Reserve or sunbathing on the shore – a quiet spot can easily be spotted. An equally rewarding detour by car takes you to the nearby Pacific coast. 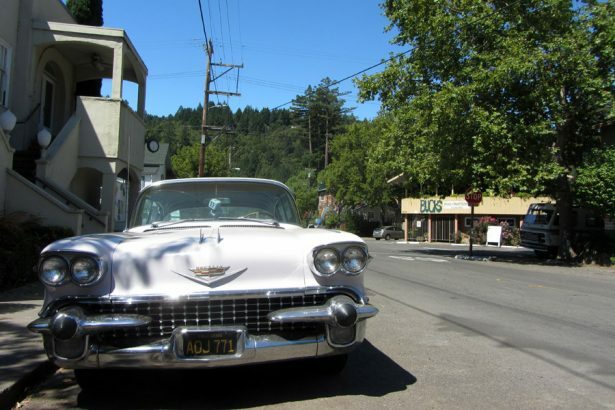 The Bohemian Highway leads through dense forest, past dreamy places like Freetown to Bodega Bay. Alfred Hitchcock shot “The Birds” in theis picturesque fishing village. You can admire one of the most beautiful beach sections of the Californian coast when driving down the famous Highway 1. You can watch young surfers riding the waves in some places, whereas big sea elephants doze around Goat Rock. Another unique experience is a visit to Osmosis Spa on Bohemian Highway. You can have excellent massages here as well as trying a bath in hot, fermented cedar wood shavings. In short: Here you feel right at home. Official homepage of Sonoma County offering various tips for the region and information for gays and lesbians. SWISS offers daily flights to San Francisco via Zurich from 10 German airports. Returnf ticktes are available from 698 Euros. Keep your eyes peeled for special offers on the airline’s homepage. Sonoma and Russion River are about 1 hours away from San Francisco by car. Holidayautos offers a one week rental from/to San Francisco from 177 Euros. It can be booked at a travel agents or online. Wine lovers and those who wish to become one can rely on Gary Saperstein and Mark Vogler. If you book a tour as couple or in a group: their company Out in the Vineyard offer bespoke tours through vineyards and enable wine tasting at unsual locations.